If you are looking for automatic file versioning for Windows, check out BackupChain, the most advanced backup software with versioning for Windows used in over 80 countries. BackupChain can do a lot more than just version backup; check out the summary below and download the full version for a test drive! Versioning is a simple way to preserve past revisions of files. Say you are working on a Microsoft Word document for weeks. Each time BackupChain runs, it detects you made changes and automatically backs them up. Because you want to be sure to don’t lose anything, you decide to keep the entire file version history, no matter how long. If anything goes wrong and you want to revert to an older copy of your DOC file or if you just want to have a look at a previous version of the document, you can simply open the version from the backup folder. File versioning backup software can be used on a variety of systems and platforms. For example, on NAS devices like Drobo, Synology, Qnap, Buffalo, and D-link. Others use file versioning control for source code, C++, C#, visual studio, PHP, or PowerShell or even geodatabases and AutoCAD. Furthermore, file versioning is very useful for databases and virtual machine disks, such as SQL Server, Hyper-V, and VMware, because these types of systems generate changes all the time. File versioning tools allow users to go back in time and restore an older version of the dataset or virtual machine. First we set up all source and target folders as shown below. Simply add all folders you need backed up and specify a target folder. Targets can be local paths, network shares and servers, ISCSI or SAN, servers, or FTP. There are several unique ways in which BackupChain controls file versioning and the main filter as you see on the left is the file type (file extension). Basically, you can set up entirely different settings for different kinds of files. For example, if you would like to keep the last 100 revisions of Word documents, you would enter a new row for *.doc or *.docx and set ‘number of backups’ to 100. BackupChain can far more than just create versions of files and data. In addition to controlling clean up by using the ‘number of backups’ setting discussed above, you can also choose to compress files using a standardized format, such as ZIP or 7-zip, and also use deduplication on a file basis. For example, in the default settings you will find BackupChain turns on compression and deduplication for *.VHD and *.VHDX files. Retention periods can also be specified using a time period, such as ‘7 months’. This setting basically deletes a backup file when it has resided in the backup folder for a certain period of time. Delayed deletion is a great tool to protect from accidental deletions and also save storage space at the same time. While the default settings are such that deleted files will be kept forever, you could arrange the file versioning control to delete files after, say 30 days, when BackupChain detects the original file was deleted. The process for setting up versioning on network storage devices, such as Buffalo, Synology, and QNAP, is very similar. You can pull files and also send files to these devices. In the Folder tab, select all network folders you wish to back up from and in the Backup Target tab, enter the target folder. When you set up BackupChain you don’t have to set up different settings for all the various file types out there. There are already dozens of presets and at the top, the *. * row sets up all the configuration for all files types not defined in the table. However, if you would like to set up very fine-tuned rules, you can do that in BackupChain by simply adding a row for the specific file extension you would like to control. See examples below. Versioning backup is extremely useful for software developers as source code files are constantly changed and added. Using BackupChain you get a consistent snapshot of all your source code files and trees on top of file version control and maintenance. Sure there are source code control solutions out there, but nothing beats the flexibility and simplicity of using BackupChain because in a recovery scenario you don’t have to install complicated software; you would simply open the file you need from the backup folder! You don’t have to define rules for all of these file types as the *. * row at the top of the File Types table in BackupChain will include these files automatically; however, if you wanted different settings for each type of file, you would simply add a row for each exception. 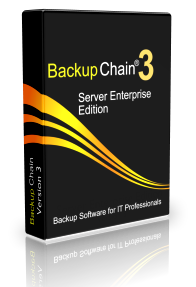 There is only one version backup software available that provides compression and deduplication: BackupChain. Download it today and use it to protect your file server files, source code files, AutoCAD, or virtual machines and databases. Pull out any file at any time using Windows Explorer. It’s simple, easy, and reliable.